Holocaust Memorial Day Trust is delighted to announce that The Prince of Wales will succeed The Queen as its Patron. By continuing the charity's Royal Patronage, His Royal Highness has formalised the support and interest which he has already demonstrated for the work of the charity, as well as the work of organisations that support survivors of the Holocaust and subsequent genocides. 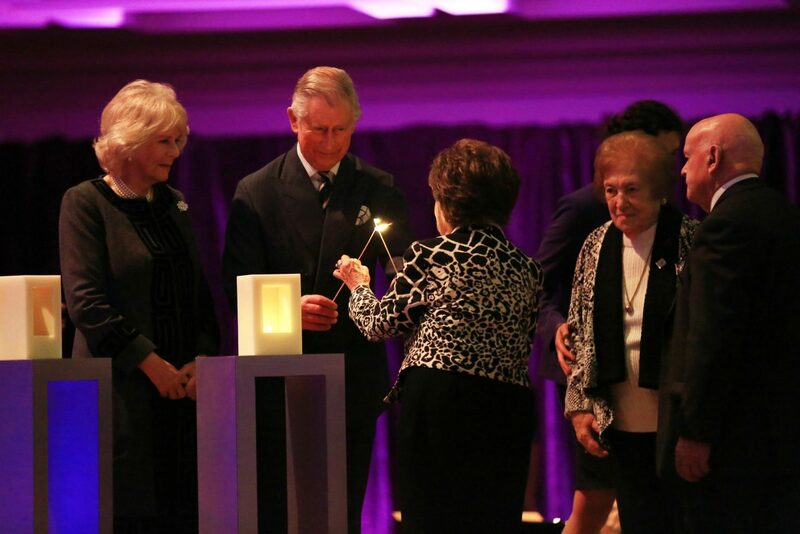 Holocaust Memorial Day Trust is hugely grateful to Her Majesty for her work as Patron since its inception 10 years ago. During 2015, a significant anniversary year, The Queen visited Bergen-Belsen where she met survivors and liberators of that concentration camp and hosted Holocaust survivors at her Garden Parties at Buckingham Palace in honour of their contributions to Holocaust commemoration in the UK. The Prince of Wales has a longstanding relationship with the Jewish community and a dedication to remembering those affected by the Holocaust. The Prince, accompanied by Her Royal Highness The Duchess of Cornwall, attended the official Holocaust Memorial Day UK Commemorative Ceremony in 2015, marking the 70th anniversary of the liberation of Auschwitz-Birkenau. The Holocaust is an unparalleled human tragedy and an act of evil unique in history and it is for these reasons that we must always remember it and honour its Jewish victims and the Nazis' other victims. ...The memory of this suffering and the unspeakable, yet almost incredible, details of the Nazis' diabolical enterprise can help future generations, wherever they may be, understand not just what happened across Europe, but how this came to happen. His Royal Highness has also hosted and attended numerous Kindertransport events, including the 75th anniversary of the Kindertransport in 2013. His Royal Highness was also the first member of the Royal Family to attend the installation of the Chief Rabbi, attending the ceremony for Chief Rabbi Ephraim Mirvis at St John's Wood Synagogue in North London in 2013. Holocaust Memorial Day Trust is the charity, supported by the UK Government, that promotes and supports Holocaust Memorial Day in the UK. Holocaust Memorial Day is commemorated each year on 27 January, and is an opportunity for everybody to reflect on the Holocaust, all forms of Nazi persecution, and the subsequent genocides that took place in Cambodia, Rwanda, Bosnia and Darfur. We are honoured that His Royal Highness The Prince of Wales has chosen to accept our invitation to succeed The Queen as Patron of the Holocaust Memorial Day Trust. Survivors of the Holocaust and subsequent genocides are hugely appreciative of The Royal Family's recognition of the importance of commemorating the dreadful persecution which they endured.